Dr. Neal F. Kassell, chairman of the Charlottesville-based Focused Ultrasound Foundation, has been named to the National Cancer Institute’s Blue Ribbon Panel for Vice President Joe Biden’s National Cancer Moonshot Initiative. Focused Ultrasound Foundation raises funds and sponsors research in promoting the global adoption of focused ultrasound treatments for a wide variety of diseases. 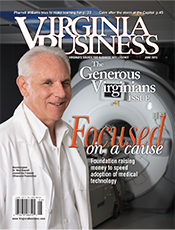 Virginia Business profiled Kassell and the foundation in its June 2015 issue. Canadian Pacific Ltd. has ended its quest to acquire Norfolk Southern Corp.
E. Hunter Harrison, the CEO of Calgary-based Canadian Pacific said in mid-April there was “no clear path to a friendly merger at this time,” according to The Associated Press. Norfolk-based Norfolk Southern had rebuffed repeated offers from the Canadian railroad since November, saying they were inadequate. The top offer totaled nearly $30 billion. Norfolk Southern’s resistance to the merger offers was supported by Gov. Terry McAuliffe, Virginia’s congressional delegation and state legislators. A federal judge in West Virginia sentenced former coal executive Don Blankenship to a year in prison in connection with an explosion that killed 29 miners in 2010. Blankenship, the former CEO of Richmond-based Massey Energy, was convicted in December of a misdemeanor charge of conspiring to “willfully violate mandatory mine health and safety standards” at the Upper Big Branch mine in West Virginia. In addition to the prison term, Blankenship was ordered to pay a $250,000 fine. Bristol-based Alpha Natural Resources bought Massey in 2011. Alpha settled with the Justice Department for $209 million in fines, penalties and compensation to the victims’ families. Virginia Business has followed the mine disaster story since 2010.